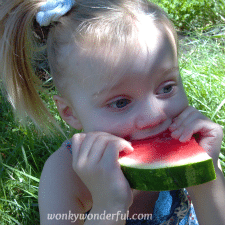 My summertime memories from childhood are filled with juicy watermelon dripping down my chin. 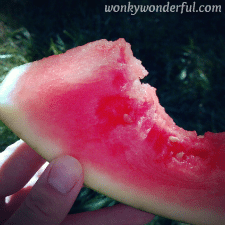 Along with seed spitting contests with my cousins.Does anyone else miss having large black seeds in their watermelon? 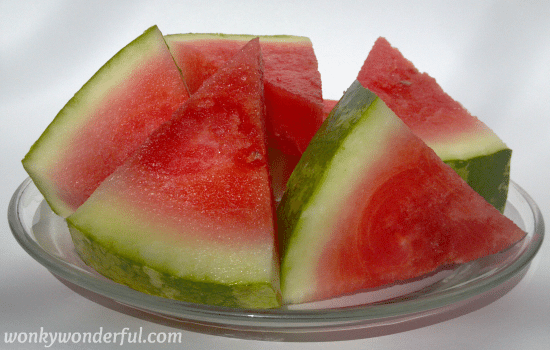 … What happened to the seeds?Back to watermelon, such a wonderful summertime tradition. I’ve always enjoyed my watermelon by the slice. 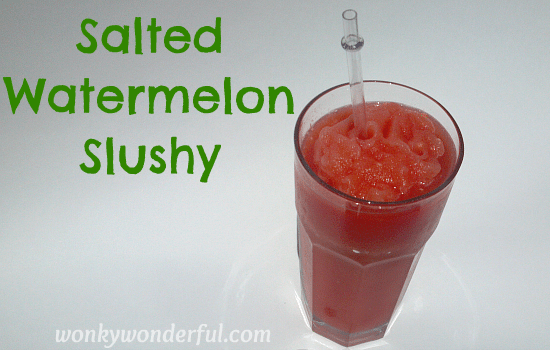 When I came across some recipes for watermelon smoothies and slushies, I thought it was a great idea and something different to try.I’ve tried several recipes using either lemonade or lemon/lime soda for the liquid ingredient. While these recipes were tasty, I thought the watermelon was a bit overpowered by the added citrus flavors. So, after some experimenting, I have a concoction that is Absolutely Watermelon! 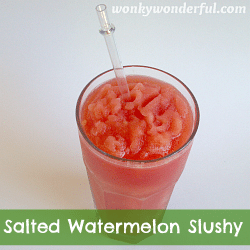 And I am one of those crazy people that like a sprinkle of salt on my watermelon slices … So, I added a dash of salt to my Watermelon Slushy.This slushy is healthy, refreshing and super simple to make. 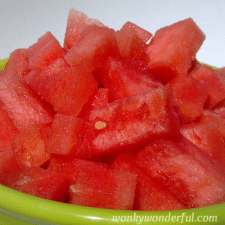 Blend the frozen watermelon chunks until smooth and no chunks remain. 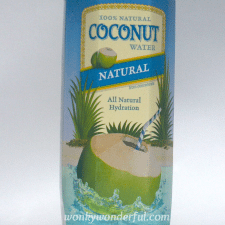 (I use my hand blender) Add the coconut water and honey and blend until incorporated into the watermelon slush. Pour into glasses and add a sprinkle of salt. This recipe made almost 2 quarts of slushy. Have any questions or comments? Feel free to email me directly at wonkywonderful@gmail.com.